As a BMW enthusiast, I became inundated this week with people telling me about a recent billboard exchange of words between Audi and BMW. I'm sure you have seen it, it's basically BMW responding to Audi's recent campaign that directly challenges Audi's main competitors: BMW, Mercedes and Lexus. The Audi billboard reads, "Your Move BMW" with a photo of their new A4 sedan. 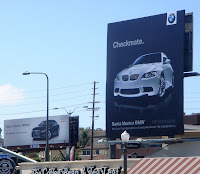 BMW responded with a billboard across the street saying "Checkmate" with their new M3 coupe. All of this brought out the alpha-male in all my car enthusiast friends and certainly provided some nice laughs at the Audi fan boys. Since this has spread across the web in typical viral fashion via Facebook, emails, Twitter, and even my non-automotive friendsa asked if I saw the billboards, Audi had to come back with a response. Audi decided to engage its fans by asking its Facebook fan page members to develop a new billboard mocking BMW's "Checkmate" statement. What came back were several images of Audi's supercar R8 and a few featuring the new S5 sport coupe. Slogans included responses like "Game over"; "Run along children, play time is over"; and "Let's up the stakes". It was a good attempt to bring the fans into the dialog, instead of Audi marketing coming up with some witty reply or ignoring the viral laugh BMW gave the web. The unfortunate part for Audi (and yes I'm trying to be a subjective BMW owner, I know it's not possible) is that the clever statement of BMW is like the well timed, sarcastic comment at a party that should just stop there, but someone always tries to carry it out without the same successful wit.